Hi! I listen to your show every day on the way to work (A long with a few other science ones) and I've got a good question that no one I know seems to know the answer to. I've had a runny nose and attendant sinus and throat trouble for about a week. Why does my nose run so long, and why can't I turn it off? Is there really no better way than just blowing my nose every few minutes and waiting for it to stop? Adam - The nose acts as a very sensitive organ to control the temperature of air and the particles in the air being inhaled. So on a cold day, more blood will be sent to the lining of the nose to warm the air up and this produces mucus, hence the runny nose. Likewise for toxic chemicals or even the chemicals in the hot chili, the same process will happen. The lining of the nose will become injected blood and the lining will produce more mucus and a runny nose. Felicity - OK, so there's not much I can do about cold air and toxins but what happens if I have an allergy like hayfever? Adam - Then the cells in the lining of the nose will produce a histamine reaction, which causes swelling of the lining of the nose, hence the runny nose. This can be controlled, either by avoiding the allergen or any toxic chemicals but also an allergic reaction can be controlled by a local medical treatment, a nose spray, dampening down the histamine reaction or by taking drugs. Also, you may have a runny nose because you've been crying a lot. The tear ducts in the eye run drain into the nose and hopefully this can be cured quickly with a hug or help from a loved one. 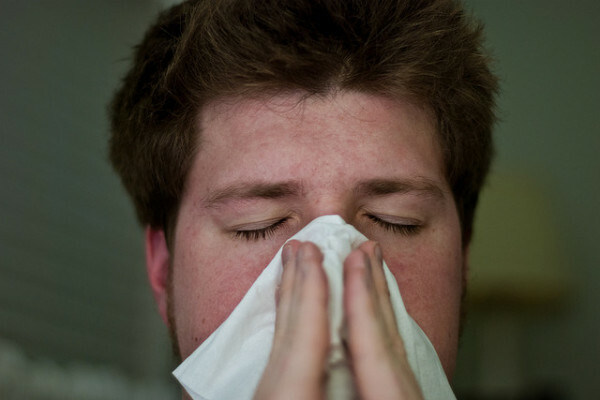 By far the most common cause of a runny nose is a virus, otherwise known as the common cold. And this, unfortunately, has no treatment apart from patience and forbearance and a lot of tissues. Jess - What would happen if I plucked a guitar in space? Previous Can I play a guitar in space? Next Why do we lose hair on our heads and not the rest of our bodies?